After Fry and Bender get fired for hooking the Planet Express building to the ship and flying all around the world (along with Leela, who should have stopped them), they get jobs at Applied Cryogenics (at least Fry and Bender do. Leela gets a job as a pizza delivery girl), where Fry discovers that his girlfriend Michelle froze herself as well. Ascended Extra: Michelle first appeared as a throwaway character illustrating how sucky Fry's life was in the 20th century. Now she's the focus of an episode. Bad Job, Worse Uniform: Leela as a pizza delivery girl with her degrading pizza hat. Bedsheet Ghost: Bender wears this with a white sheet over his head to scare Fry and Michelle while they were kissing. Bilingual Bonus: When the children's mother picks them up, she says they have to go to Hebrew school. Right before the death rolling, Butch's girlfriend counts in Hebrew. Blood Sport: Deathrolling. "It's just like skateboarding, except half the time somebody dies." Fry: Oh, so it's a little safer than skateboarding. Book-Ends: The pilot introduces Michelle by having her drive past Fry in a cab with someone else. The episode ends with her doing the same thing. Bowdlerization: After the Norway terrorist attacks in 2011, some versions of this episode are re-animated so that way the chip on the dismembered arm Bender uses is from a chainsaw juggler instead of the Prime Minister of Norway. Netflix used to have the original "Prime Minister of Norway" take, but when they added the last half of the series (from "2-D Blacktop" to "Meanwhile"), they changed it to the edited "Chainsaw Juggler" version. Challenging the Chief: Encouraged by Michelle, Fry challenges the kid chief. The plot starts because Leela tied down the ship with the unbreakable diamond filament, from "The Deep South". 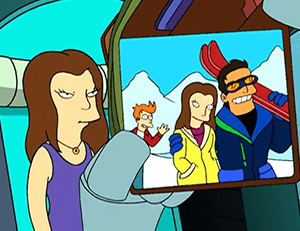 Leela held onto the career chips from "Space Pilot 3000" and uses them to at least get Fry a job at Applied Cryonics, after she summarizes the events of that episode. Crush. Kill. Destroy! : Bender mimes a killer robot in order to scare a cryonic clients. Cue the Falling Object: When Bender and Fry return from their joy ride, they look into the angry faces of their crew mates. Then the wall behind them topples. Distinction Without a Difference: Fry, on describing his and Michelle's restarted relationship. Fry: Before, she was demanding and possessive. Now, she wants me to do things, and stay with her all the time. Early Installment Weirdness: Michelle claims that Fry's parents where so indifferent to him they thought a police search after he disappeared would be a "waste of tax-payers money." Later episodes like "Luck of the Fryish", "Cold Warriors" and "Game of Tones", would show that all Fry's relatives cared for him deeply despite their oddness and seeming jerkisness. Easily Forgiven: By the end of the episode, the Professor takes the trio back in, because he's forgotten why he fired them in the first place. Then Bender reminds him. The Professor angrily declares he should fire Fry, Leela and Bender after what they did, but he's not cold-hearted enough. He then immediately turns to Hermes, who is that cold-hearted enough. Michelle tells Fry they should go to the year 4000 and not regret it. On waking up in the apparent wasteland of the 41st century, Fry informs her he doesn't regret it, but he does "rue and lament" it. Faked Rip Van Winkle: Fry and Michelle think they stayed frozen until an apocalyptic 41st century, but are just in 31st century Los Angeles. Fish out of Water: Michelle does not handle the 31st century well at all, which leads to an observation of how well Fry handled the 31st century but did not fit into the 20th century. Freak Out: Michelle has a few of these concerning the weird things of New New York. And inverted when she meets Zoidberg, since he's the one that freaks out. Guilt by Association Gag: Leela gets fired along with Fry and Bender when they take the Planet Express ship (along with the building) out for a joyride. The Professor justified this by saying she left the key in the ignition. Inspirational Insult: Michelle tries to motivate Fry by saying "My mother said you'd never amount to anything, now get out there and prove her wrong! "; Fry's response is a very hurt "Beth said that?" Lampshade Hanging: When Leela brings up the career chips, Fry has completely forgotten them, because the concept had completely fallen by the wayside right after the pilot. Monumental Damage: Fry and Bender joyride across the world with the Planet Express ship hitting the Leaning Tower of Pisa upright then knocked down completely with the Planet Express building being tethered behind the ship. Mundane Utility: Fry uses a cryonic chamber as a freezer for his drinks. Not So Remote: Fry mistakes contemporary Los Angeles for a post-apocalyptic wasteland left in the wake of New York. Overshadowed by Awesome: Parodied, as one the trio are fired, Zoidberg rejoices that he will now be the popular one. Sure enough, everyone starts taking an interest in Zoidberg. Parental Neglect: Fry mentions that his parents called off the search party for him and took him off school in order to save tax payers money. Pop-Culture Pun Episode Title: The episode title is a pun on The Bionic Woman. Sequel Episode: The episode is essentially a sequel to the pilot episode (showing how far Fry's come, reminding us of what his life was like before he was frozen and showing how someone might suffer for being a Fish out of Water in his situation). They even pointed this out in the DVD commentary. Stupidest Thing I've Ever Heard: Fry about his own suggestion on how to get hold of money after they have been fired. "Well, what do you suggest? A daring daylight robbery of Fort Knox on elephant back? That's the dumbest thing I ever heard." Take That! : To Los Angeles. As Fry gives a litany of how awful it was, Bender lampshades it by saying, "He just won't stop with the social commentary." Teenage Wasteland: Fry thinks this is the case with the kids who capture him and Michelle... until their mothers come to pick them up for Hebrew school. Trap Door: The Professor has one to disposes of Fry in the last scene.